Lehigh University (as well as a lot of the east coast) is having a very hard time this year because of all the snow storms. We are now up to 3 full days closed, as well as a half day and a 2hr delay. Which totals to about 3.75 days off this semester. I bet the university and its staff is getting very annoyed. The most recent full day off was yesterday (2/13/2014) because of the huge storm that we got. 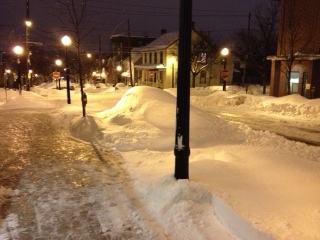 We ended up getting by approximately this morning (according to wfmz.com) 19inches of snow/ice. That is a LOT! However, the University is open today, we did have a delay of 2hrs. They, as well as all of Bethlehem was able to prepare for the storm and was able to have plows and people out shoveling to try to keep up with the snow fall. Having days off is nice but that means that you need to catch up in your classes and that is very annoying. Below are some photos of the storm. 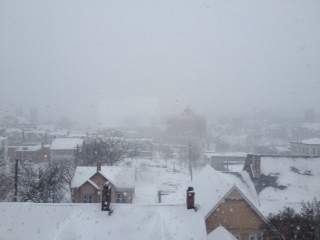 The first is a picture from my room in Brodhead, on the sixth floor, looking out the window towards Saint Lukes. However, you would not know it because you can not even see it, trust me it is there. The second one is of a car buried in the snow. That big lump you see, in the middle of the picture, is the car. 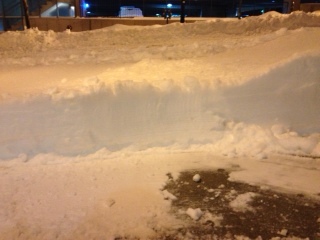 This last one is showing how deep the snow is. Now you have to add in the fact that you can only see the snow above the side walk level so the snow is deeper than it looks.